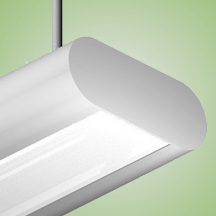 The E96V Direct/Indirect Luminaire is a contemporary styled fixture fit for modern interiors. They are designed to be pendant mounted via a rigid or cord pendant making them adaptable for a number of ceiling types and applications. This fixture is ideal for offices, libraries, schools, etc. The direct/indirect lighting configuration provides ample downlight for tasks or general illumination while providing an aesthetically pleasing uplight to brighten spaces and eliminate the “cave” effect. Provided with a ribbed acrylic diffuser on top and bottom.